U.S. border officials temporarily shut down northbound entry at the San Ysidro Port of Entry to install additional security measures. SAN YSIDRO, Calif. (KGTV) - U.S. border officials temporarily closed the northbound vehicle lanes at the San Ysidro Port of Entry Monday morning to install additional security measures. Customs and Border Protection officials closed all northbound vehicle lanes from Mexico into the U.S. at about 3:15 a.m. Officials also suspended the processing of northbound pedestrian travelers at the Pedestrian East facility. While the closure was in place, pedestrians were able to use the Pedestrian West facility to travel northbound into the U.S., CBP officials said. Most affected lanes and walkways were reopened at around 6:25 a.m., but some backup lingered following the opening as CBP officials said some select lanes would remain shut down. Southbound lanes into Mexico were not impacted during the CBP action. 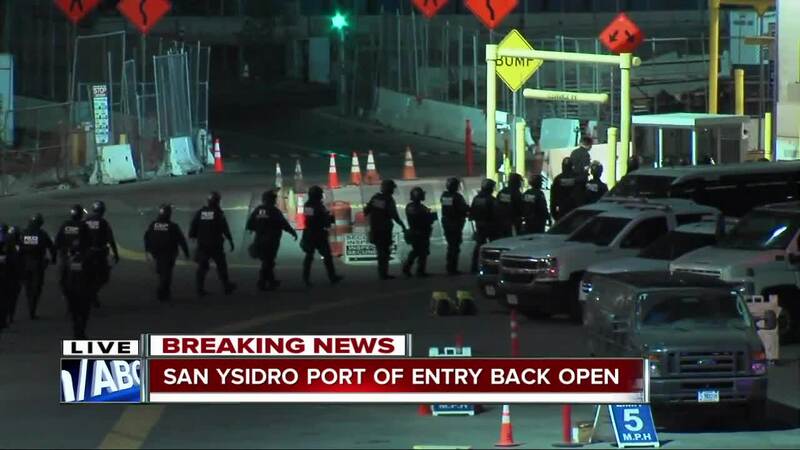 The Otay Mesa Port of Entry was open for traffic during the San Ysidro closure. The additional security measures, which included the installation of jersey barriers and concertina wire, were “to prepare for the potential arrival of thousands of people migrating in a caravan heading towards the border of the United States,” officials said.